I was out for much of the day and hadn’t seen Martha since breakfast. It looked like she hadn’t been back at all because her food was untouched. Most unusual – she likes her grub and makes numerous visits during the day to her trough. I called and called but answer came there none. Until about 9pm, when of course it was starting to get dark. It sounded like she was in next door’s garden so I asked for their help. They searched their garden, including the greenhouse, kids’ toy houses, sheds etc. No Martha. Then they checked all the rooms inside their house as she sometimes goes in through their catflap. No Martha. But we could still hear her. In the end we decided she was in the woods behind our houses and John from next door and I went out, calling. She’d answer some of the time, but not every time we called. So I decided to give her a bit more time. For all I knew, she might have been having a lovely time, thank you very much, and thinking, ‘well it’s nice to hear from you, mum, but I’ll come in when I’m good and ready’. So I came back indoors. It was still only about 10pm, on a very warm night, and she does sometimes come in quite late. But after a while I thought I’d better have another go at finding her, so out into the woods once more, now completely black. She was still calling and I was sure she sounded in distress. But I didn’t think there was anything I could do until I knew where she was, and I was unlikely to find that out until morning. So back indoors I asked my other neighbour, Jenny, if she might be around in the morning to help me search. Instead she came round with her powerful torch. And a golf club – for thrashing through the undergrowth! Out the back gate once more and still we could hear her calling but no sign of her. So we decided to come round the other way, but walking into the field behind the woods. As we approached roughly where we thought she was, her calls were definitely getting much louder. So we scrambled up through the brambles and stopped under some trees. Something made me think to shine the torch up into one of the trees – and there she was, the little madam, stuck in a cleft about 15’ foot up a tree! Aaaarrghhh. It wasn’t that far to the ground, but the tree trunk was quite smooth and over a mass of branches and brambles on the ground so she obviously didn’t like the look of the descent! No amount of pleading and persuading and encouraging would induce her to move from her ‘safe’ perch so I did have to leave her there overnight. Panicking that she would fall out during the night, injure herself, run off and be lost all over again! So, after not much sleep, was up and out again at 6am this morning. Thankfully she was still there but still just as reluctant to take a leap of faith. I managed to borrow a very long narrow plank/stick from another neighbour, hoping it might act as a flimsy ramp for her to trust. But nope. So in the end, in desperation and exasperation, I nudged her bum with the stick instead and she fell to the ground. Completely unhurt of course! And not a word of thanks! She just turned up indoors a few minutes later, scoffed several plates of food and headed straight back out into the woods. Harrrumph. This girl is in serious danger of being redesignated an Indoor Cat! My nerves can’t stand much more of this! No amount of calling or enticing tuna was going to get her down. That’s when the real fun started. This tree, you have to be aware, is at least 40ft tall, I kid you not. First I called the Fire Brigade. They won’t come out unless the RSPCA attends and calls them. So I called the RSPCA. They just suggested the tuna route. No amount of pleading that it’s a 40ft fir tree, she’s 4 months old and this is pretty much her very first encounter with a tree was going to persuade them. They apparently had no inspectors available. Gee, thanks. What is the bloody RSPCA for, I ask?! Not impressed. They suggested a tree surgeon. Great, and on a Sunday too. But that’s what we had to do in the end. Contacts in the village got us a couple of guys, grandad and grandson, from Hadlow. So up went grandson. And up and up and up and up…. Inevitably, the closer he got, the higher she went. 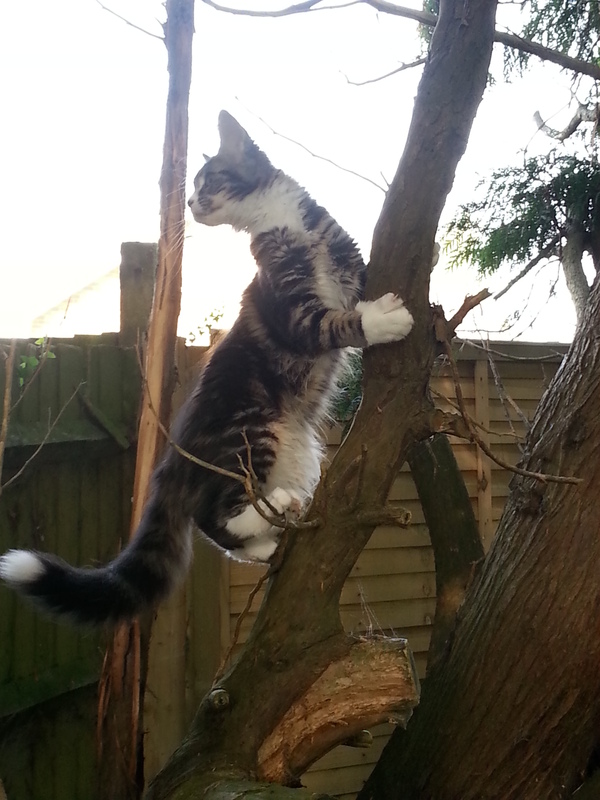 Until she was at the very top of the tree, on a spindlyest bendyest bit at the very very top. (So they tell me, I couldn’t watch by this point.) He managed to grab her and get her on his shoulder, ready to transfer to his jacket (why he didn’t take his net up I don’t know) and then what did she do? Of course, she leapt! OMFG. I was in the neighbour’s garden at this point as that was where operations were taking place so had to beetle back to our house and try to find her. I’d heard Oscar yelp from his crate in the kitchen so I guessed she’d whizzed indoors and past him. Eventually I found her on a low shelf in our lounge wall unit, apparently unhurt. And asking for food! However, I noticed later she was limping a bit. Eventually we took her to the emergency vets (£200! – hopefully at least largely covered by insurance). A good checkover suggested she’s only either broken or just sprained one or two toes. How many lives has that robbed her of, do we reckon? I don’t think my stress levels have returned to normal even now. She, meanwhile, is supposed to be resting but is hurtling around my place as though nothing’s happened. She’s still limping ever so slightly but what a lucky girl is she, eh? And thank goodness I haven’t had to call her breeder and tell her I’ve managed to kill her precious little girl within a fortnight – doesn’t bear thinking about. Why do we put ourselves through this, again, someone remind me? Oh yeah, because we adore them.